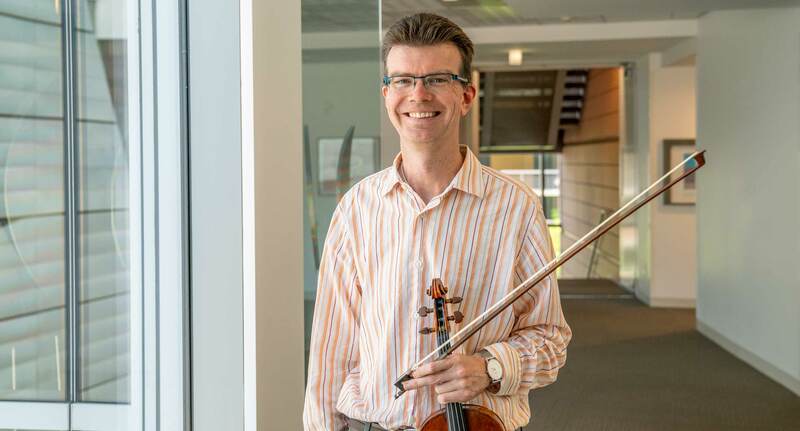 Director of Chamber Music Scott St. John discusses his program choices for the upcoming Colburn Chamber Music Society concert, and how this concert promotes his chamber music values. On Sunday, February 10, Director of Chamber Music Scott St. John will lead Conservatory students in an eclectic program of Stravinsky, Schubert, and John Adams. We sat down with him to discuss his program choices, working with John Adams in the past, and how this concert promotes his chamber music values. How did you choose the program? I really wanted to do something a little unusual and contemporary on the program. Having worked quite a bit with John Adams when I used to be in the St. Lawrence String Quartet, I thought that programming his First String Quartet from 2008 would be a great challenge—a challenge for any group, but a challenge for the students in particular. So that became this first item on the program, and then Laura Liepens, Director of Artistic Administration and Career Development, and I talked about whether to do a classical piece like the Schubert “Trout” Quintet. The Stravinsky came up because I had recently played the full version of L’Histoire du Soldat and I’ve never done the trio version, and I thought that would be an interesting project to do in different forms. What do you think the students will be able to learn from performing these pieces? The educational value is pretty high for all of these pieces. The Adams is a very difficult rhythmic piece. Basically, it’s 25 minutes of constantly shifting rhythms and one needs to be constantly counting and on one’s toes. It’s certainly a challenge for any group, but with John Adams being arguably the most performed contemporary composer, I think it’s great for the students to have experience working on his music. I think the Schubert “Trout” is a great experience because it’s one of the classics. It’s a beautiful piece but very exposed, and also requires delicacy in the style of performance. The Stravinsky is more straightforward in some ways. Yet the Stravinsky is all about countering some of the trends at the time—and his music is fascinating that way—it’s sometimes very brutal and very raw. What was the experience of premiering Adams’ First Quartet like, and how do you hope to share it with the students? Since my quartet premiered the piece, we worked a lot with John Adams even on some of the initial sketches. He was quite interested in different articulations and textures that we could get with slightly different bowings. I think that working with any living composer is a fantastic gift. You realize that composers are flexible, they love to talk about their music, and they love to try different things. I think it helps with the interpretation of any composer when you realize that that you have this flexibility of interpretation. So I’m hoping that the students will love the piece as much as I did. I probably played it 75 times in the quartet but I’ve also had a break from it, so I’m looking forward to visiting it with new ideas and new ears. How are students chosen to perform? There was a lot of discussion between the strings and piano faculty and myself, and [Christine Tanabe, Manager of Artistic Administration and Career Development]. There’s a lot of factors involved. From my perspective, one of the most important things is, is the student flexible? Do they seem like they’ll be really receptive to working on a piece and getting it ready super quickly? In other words, are they going to be professional in their style of putting it together? I think in some ways, that’s more important than, are they a great player? Hopefully they would have both, but I think the weight for me is more on the side of being a great collaborator. How has it been working with the students so far? What are you looking forward to during this rehearsal process with them? Working with the students has generally been terrific. The level at Colburn is extremely high, as we all know, and many of the students have very, very strong collaborative skills. I think what I’m looking forward to is the chance to do the quick preparation. The [Colburn Chamber Music Society] concerts are all about putting it together in a short amount of rehearsal time, so everybody has to be super well prepared in order to do the two or three rehearsals, then the concert. I think that is a slightly different skill set, and I’m looking forward to seeing if the students are better prepared, or similarly prepared, and also whether they’re willing to look at me suddenly not as a coach, but as a collaborative musician in their group. It’s more I would call Marlboro style, Marlboro being a festival in Vermont where faculty and students collaborate together. As the Director of Chamber Music here at Colburn, how do you hope this concert reflects the values that you’re trying to instill here? One of the things that I wanted to show on this concert was the diversity of repertoire that is out there for chamber music. It was quite deliberate that I tried to choose classical repertoire, I tried to choose the Stravinsky, which is by some accounts contemporary but not anymore, and then a reasonably brand-new piece, because I do think it’s important that all periods of chamber music are focused on as part of the course. Second, I really just want to promote the love of chamber music that I have. It’s something that I think someone should naturally want to explore, not because it’s a course, but because it’s an important part of the whole classical music culture. It’s where composers sometimes express their deepest feelings, their most intimate feelings, and I would like to make sure that all the students feel that chamber music is one of the pillars of their experience. I heard one of the professors describe the Colburn experience as the three pillars: your lessons, your orchestra, and your chamber music. And I think that’s a wonderful way to describe it. Hear works by Schubert, Stravinsky, and John Adams on February 10 performed by the Colburn Chamber Music Society. Get your tickets today.